On Friday night, 145 students will finish their time at Boulder City High School as graduates of the Class of 2018 are set to receive their diplomas. Celia Shortt Goodyear/Boulder City Review Members of the Boulder City High School's class of 2018 walk through campus on Monday, May 21, as they prepare to graduate and say goodbye to teachers and staff. This year’s graduation will be at 7:30 p.m. Friday, May 25, at Bruce Eaton Field on the high school campus. Spectators will need a ticket to attend. All seniors were given 10 tickets with their caps and gowns before the ceremony. Half of their tickets were designated for inclement weather and will be the only ones allowed in should the ceremony have to move into the gym. Weather forecasts for the day predict a high of 91 and plenty of sunshine. The school recommends that spectators plan to arrive at the graduation by 7:10 p.m. They will be allowed onto the field from the bleachers after the ceremony to take photos. To celebrate, members of the Class of 2018 participated in the school’s annual Grad Walk on Monday. 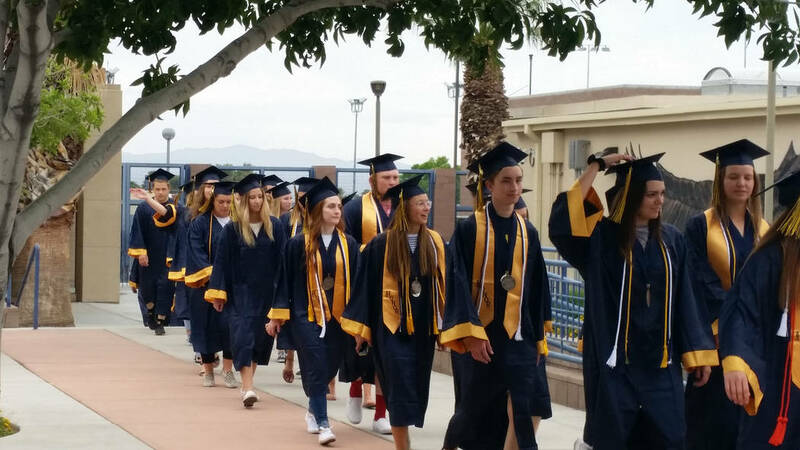 They dressed in their caps and gowns and walked en masse through the high school and around the other public schools in town to reflect on their time at school and inspire elementary and middle school students. Additionally, it is a chance for the community to celebrate the upcoming graduation with the students before the ceremony. The school encourages spectators at Friday’s graduation ceremony to listen politely to the speakers and refrain from catcalls, whistles and other verbal noises during the program because it can make it difficult to hear the graduates’ names. Air horns, noisemakers, beach balls and “other nuisance items” are not allowed, according to the school. Anyone who does not follow the rules will be removed from the audience.